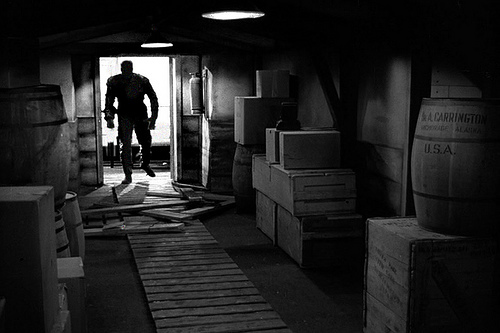 Today, I'm reviewing the science fiction classic The Thing from Another World (1951), which stars James Arness as an alien who menaces a polar research station. This article is part of Keep Watching the Skies! Science Fiction Movies of the 1950s Blogathon hosted by Cinematic Frontier. The famous phrase "keep watching the skies" originated in the seminal science fiction classic The Thing from Another World (1951). Producer Howard Hawks tapped into the paranoia and angst of the Atomic Age to create a chilling thriller about the dangers of unchecked scientific advances and humanity's loss of control over its own environment. The Thing from Another World begins when U.S. Air Force Captain Patrick Hendry (Kenneth Tobey) and his crew are assigned to investigate the crash of a strange aircraft near a scientific outpost on the North Pole. Hendry and his men, along with several scientists from the outpost, find a downed flying saucer and a large alien (James Arness) that is frozen in block of ice. Hendry and the researchers cart the alien back to the outpost, but, when the big guy thaws out, the outpost's unlucky residents are soon being terrorized by a lean, mean blood-thirsty machine of unknown origin. The Thing from Another World was based on writer John W. Campbell, Jr.'s short story, "Who Goes There? ", which first appeared in a 1938 edition of the magazine, Astounding Science Fiction and Fact. Campbell's original story was an intricate tale of a terrifying shape-shifting being -- that aspect of the story was captured in director John Carpenter's remake, The Thing (1982) -- that was boiled down to its taut essentials by screenwriter Charles Lederer. 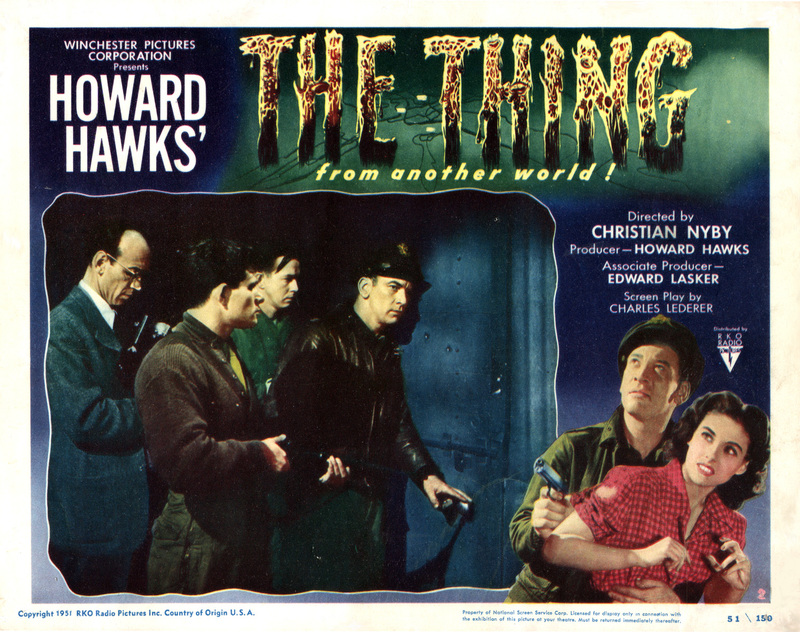 Legendary Hollywood director Howard Hawks produced The Thing from Another World for his own Winchester Pictures, and, even though Hawks was well-known for making glossy big budget features like To Have and Have Not (1944) and I Was a Male War Bride (1949), this movie perfectly suited his no nonsense style. In fact, many film scholars think Hawks actually directed the film, although his longtime editor Christian Nyby received onscreen credit (the theory goes that Hawks allowed Nyby to have screen credit so he could obtain a Director's Guild membership, and there are conflicting stories among the cast about who actually directed the movie. William Self, who played a member of the Air Force crew, was probably most accurate when he stated, "Chris was the director in our eyes, but Howard was the boss"). A publicity still for The Thing from Another World featuring Robert Cornthwaite (far left); Dewey Martin; Kenneth Tobey (front with axe); James R. Young; John Dierkes, and Paul Frees. No matter who deserves the directing credit, The Thing from Another World is filled with Hawks' signature directorial touches. There's a lot of fast-paced overlapping dialogue (see His Girl Friday), a group of macho pilots facing down the elements (see Only Angels Have Wings), a sultry deep-voiced love interest (Margaret Sheridan) for the leading man, and even some in jokes about Hawks earlier movies (at one point an airman played by Robert Nichols says that he learned to shoot by watching Hawks 1941 biopic Sergeant York). 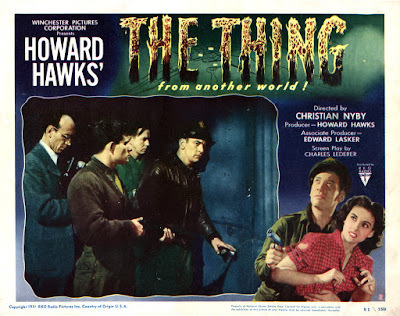 Viewed today, The Thing from Another World certainly isn't as scary as it must have been for fifties audiences, but it is still a fun entertainment that whizzes by at one hour 27 minutes. The production values and special effects are fairly good, but the acting is all over the place. Sheridan is too giggly for someone who is being menaced by a giant bloodsucking vegetable, and Tobey never quite matches the he-man heights of John Wayne or Gary Cooper, but supporting players Robert Cornthwaite and Douglas Spencer give exceptional performances. Cornthwaite, who plays an Arctic researcher who wants to study the alien, spouts scientific gobbledygook like his life depended on it, and Spencer, playing an amiable reporter who stumbles on the scoop of a lifetime, gets the movie's downbeat final word (clip below). In fact, The Thing from Another World is a forerunner of much of today's pop culture with its focus on alien invasions and conspiracy theories. In many ways, the "keep watching the skies" catchphrase was the first sign of a new America. The wholesome values of Andy Hardy were gone, replaced by a new age of government cover-ups and unchecked scientific advances. The Thing from Another World will air at 4:45 p.m. Oct. 29 on TCM. It is also available on DVD and video on demand. I remember watching this one Saturday afternoon when I was a young boy. (Oh the halcyon days of youth when I had time to watch endless hours of old sci-fi and horror movies on the local UHF station.) This is a great one, even if the creature was not all that scary to me. I watched this movie as a kid too, and I was terrified of the monster. My best friend's older cousin tried to scare us by saying that the vegetables in the refrigerator had turned into a giant monster. Love this film and the camaraderie among the characters. Amazing to think that in 1951 it was considered 'For Adults Only'! How times have changed. I liked Kenneth Tobey in the lead - his only leading role? His IMDB mostly has other sci-fi movies and TV appearance, including Gunsmoke with none other than James Arness.